Victor Frederick Weisskopf in the 1940s. 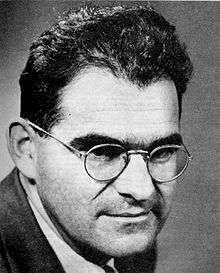 Victor Frederick "Viki" Weisskopf (September 19, 1908 – April 22, 2002) was an Austrian-born American theoretical physicist. He did postdoctoral work with Werner Heisenberg, Erwin Schrödinger, Wolfgang Pauli and Niels Bohr. During World War II he was Group Leader of the Theoretical Division of the Manhattan Project at Los Alamos, and later campaigned against the proliferation of nuclear weapons. Weisskopf was born in Vienna to Jewish parents and earned his doctorate in physics at the University of Göttingen in Germany in 1931. His brilliance in physics led to work with the great physicists exploring the atom, especially Niels Bohr, who mentored Weisskopf at his institute in Copenhagen. By the late 1930s, he realized that, as a Jew, he needed to get out of Europe. Bohr helped him find a position in the United States. In the 1930s and 1940s, 'Viki', as everyone called him, made major contributions to the development of quantum theory, especially in the area of Quantum Electrodynamics. One of his few regrets was that his insecurity about his mathematical abilities may have cost him a Nobel prize when he did not publish results (which turned out to be correct) about what is now known as the Lamb shift. From 1937 to 1943 he was a Professor of Physics at the University of Rochester. After World War II, Weisskopf joined the physics faculty at MIT, ultimately becoming head of the department. At MIT, he encouraged students to ask questions, and, even in undergraduate physics courses, taught his students to think like physicists, not just to learn physics. He was a memorable teacher. Weisskopf was a co-founder and board member of the Union of Concerned Scientists. He served as director-general of CERN from 1961 to 1966. Weisskopf was awarded the Max Planck Medal in 1956 and the Prix mondial Cino Del Duca in 1972, the National Medal of Science (1980), the Wolf Prize (1981) and the Public Welfare Medal from the National Academy of Sciences (1991). Weisskopf was a member of the National Academy of Sciences. He was president of the American Physical Society (1960–61) and the American Academy of Arts and Sciences (1976–1979). He was appointed by Pope Paul VI to the 70-member Pontifical Academy of Sciences in 1975, and in 1981 he led a team of four scientists sent by Pope John Paul II to talk to President Ronald Reagan about the need to prohibit the use of nuclear weapons. He married Ellen Tvede. He was survived at death by his second wife Duscha. In class one day, speaking to junior physics majors (Spring, 1957): "There is no such thing as a stupid question." Weisskopf, Victor; Blatt, J. M. (1952). Theoretical Nuclear Physics. New York: John Wiley. Weisskopf, Victor (1963). Knowledge and Wonder: The Natural World as Man Knows It. New York: Anchor Books/Doubleday & Co. (Science Study Series S31). Weisskopf, Victor (1970). Modern Physics from an Elementary Point of View. Geneva: CERN. Weisskopf, Victor (1972). Physics in the Twentieth Century: Selected Essays. Cambridge, Massachusetts: MIT Press. Weisskopf, Victor; Kurt Gottfried (1984). Concepts of Particle Physics, vol. 1. New York: Oxford University Press. Weisskopf, Victor; Kurt Gottfried (1986). Concepts of Particle Physics, vol. 2. New York: Oxford University Press. Weisskopf, Victor (1989). The Privilege of Being a Physicist. Essays. New York: W. H. Freeman. Weisskopf, Victor (1991). The Joy of Insight: Passions of a Physicist. New York: Basic Books. ↑ "Weisskopf dies at 93; was protégée of physicist Niels Bohr". MIT News. 24 April 2002. Retrieved 20 February 2015. ↑ "Victor Weisskopf, Group Leader - Los Alamos Theoretical Division". The Manhattan Project Heritage Preservation Association, Inc. 2005. Retrieved 20 February 2015. ↑ Office of the Home Secretary; National Academy of Sciences (1 January 2004). Biographical Memoirs. Vol. 84. National Academies Press. p. 375. ISBN 978-0-309-08957-9. ↑ Gottfried, Kurt; Jackson, J. David (February 2003). "Mozart and Quantum Mechanics: An Appreciation of Victor Weisskopf" (PDF). Physics Today. 56 (2): 43–47. Bibcode:2003PhT....56b..43G. doi:10.1063/1.1564348. ↑ "Who's who in Cern: Victor F. Weisskopf". CERN Courier. 1 (15): 2. Winter 1960. ↑ Hine, Mervyn (January 2003). "Working with Viki at CERN". CERN Courier. ↑ Kummer, Wolfgang (June 2002). "Victor Weisskopf: looking back on a distinguished career". CERN Courier. 42 (5): 28–32. ↑ "Farewell to Professor Weisskopf". CERN Courier. 6 (1): 3–5. January 1966. ↑ "People and things". CERN Courier. 23 (10): 432. December 1983. ↑ "Public Welfare Medal Recipients". National Academy of Sciences. 2015. Retrieved 20 February 2015. ↑ "Past and Present Presidents". American Physical Society. 2015. Retrieved 20 February 2015. ↑ "Academy Presidents". American Academy of Arts & Sciences. 2015. Retrieved 20 February 2015. ↑ Carl Sagan; Hans A. Bethe; S. Chandrasekhar et.al. (January 1990). "Preserving and Cherishing the Earth". Yale Forum on Religion and Ecology. Retrieved 20 February 2015. ↑ "Weisskopf wins Oppenheimer Prize". Physics Today. American Institute of Physics. 36: 77. July 1983. doi:10.1063/1.2915767. Retrieved 1 March 2015. ↑ "Reply to a parliamentary question" (pdf). Österreichisches Parlament (in German). Wien. 23 April 2012. p. 1372. Retrieved 5 January 2013.